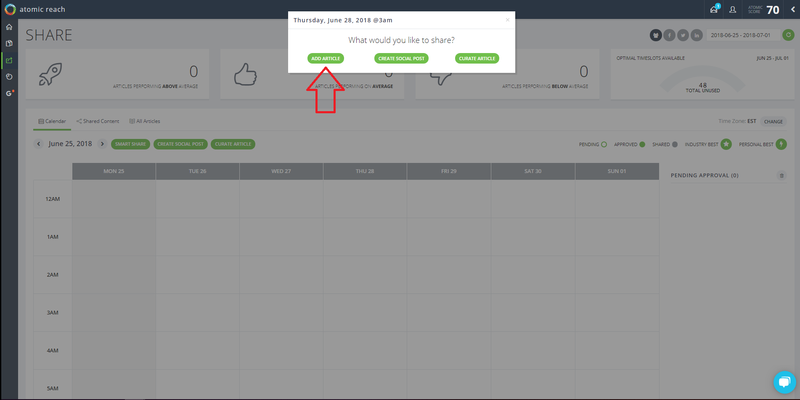 Share is the all-in-one smart social scheduling tool packed in a clean calendar interface. 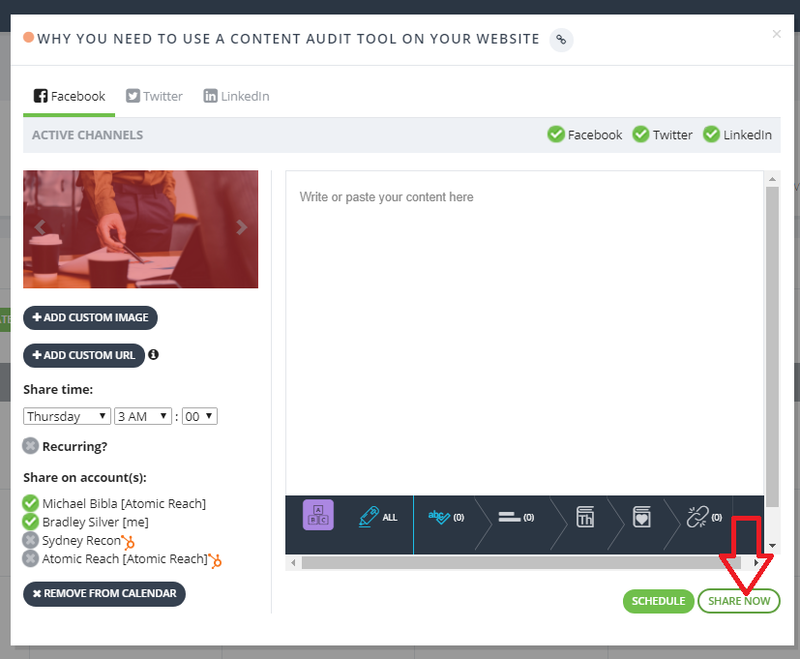 You can create original social shares, share your articles, and curate interesting content to your followers. Share one of your own articles. 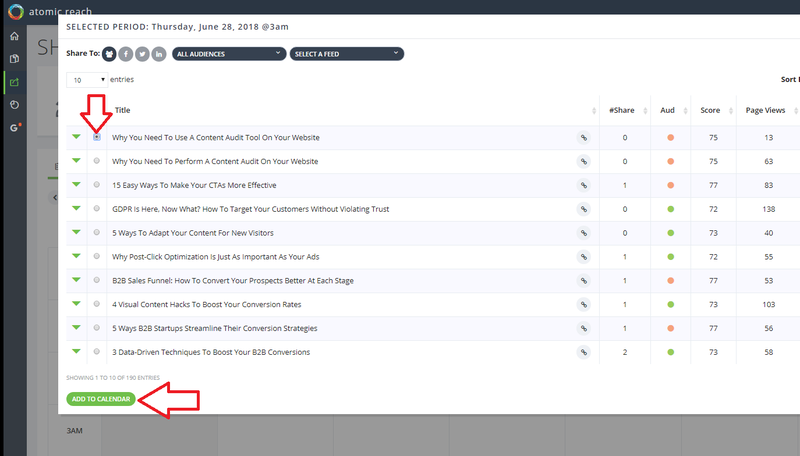 Step 1: Click on a time slot in the calendar and choose the Add Article option. Step 2: Select the article you would like to share to your social network, press Add to Calendar when you are finished. Tip: You can see which articles have performed well in the past including the engagement of individual shares by pressing on the green triangle. Step 3: In the pop-up, select the social networks you would like to share your article to. Step 4: Attach any images you'd like to accompany your article.Tip: We will try to grab the images in the article. You can always upload a custom image. Tip: Twitter posts have the option to be shared as a Twitter card. However, this means you cannot set the image. Step 5: Double check the correct time and social accounts are selected. Step 6: Add in the accompanying comment for each social network. Enjoy a slim version of the same editor from Create to help you craft the perfect comment. Tip: Make sure you add in the comment for each social network if you have more than one social network selected (i.e. you need to write comments for both Facebook and Twitter if you selected both in Step 2). Currently we do not support different comments on different accounts sharing the same post to the same network. Step 7: You can share the article to your network immediately via the Share Now button or schedule it into your calendar for the selected time in Step 5 via the Schedule button.